This article originally appeared in the February 2003 issue of Health Care News. Michigan's state budget deficit could approach $2 billion in the next fiscal year. Eleven other states are on pace to see deficits at or over the $2 billion mark. In Illinois and Wisconsin, the budget gaps may be closer to $3 billion. New Jersey's is $4 billion, Texas's as much as $8 billion, and California's $25 billion. According to the National Conference of State Legislatures (NCSL), two-thirds of the states have reported revenue collections for the early months of the 2003 fiscal year are below forecasted levels. New York, for example, estimates a revenue shortfall of up to $10 billion over the next two years. While state revenues are slumping, expenditures on Medicaid are increasing at a rapid pace. They are a driving force behind the budget deficits most state legislatures are facing as they open their 2003 sessions. Medicaid spending increased by 13.3 percent in fiscal year 2002 and 10.6 percent in fiscal year 2001. Total revenue growth over the same period was just 5 percent, according to the National Association of State Budget Officers. The gravity of the problem becomes apparent when one realizes Medicaid spending comprises more than 20 percent of all state expenditures. The situation is not sustainable; to balance state budgets will require tough decisions by governors and state legislators. Forty-four states will consider measures to control Medicaid costs, including freezing or reducing eligibility, benefits, and/or reimbursement rates, according to the recent Health Policy Tracking Service Survey conducted by NCSL. Massachusetts has already taken such steps. Up to 50,000 people lost Medicaid eligibility at the beginning of the year, and thousands more had their benefits cut. Massachusetts House Speaker Thomas Finneran said such steps were necessary because soaring Medicaid costs could soon "bankrupt" the state. But Medicaid cut-backs can be a double-edged sword. During an economic downturn–when state revenues fall and policymakers might consider Medicaid cuts to balance budgets–more workers can lose the health insurance coverage they received through their employers. If state actions deny Medicaid eligibility to those individuals or limit the benefits available to them, states compound the problem of lack of access to care. Overall health care spending might increase because uninsured patients must rely on expensive emergency rooms for treatment. Some states are considering tax increases to pay for Medicaid and other public health initiatives. This move is unpopular with taxpayers in many, but not all, parts of the United States. Voters in Los Angeles County voted last year to raise their own property taxes to keep hospitals open and prevent a collapse of the local public health system. Voters in Arizona passed a ballot measure to double the state's cigarette tax and dedicate the resulting $150 million for trauma centers. Raising taxes, like cutting eligibility for Medicaid, can aggravate rather than solve the access problems of the poor. High and rising taxes relative to other states can result in lower rates of income and employment growth. Slower economic growth means fewer people are able to afford to buy private insurance or have employer-provided coverage. Given recent trends in health care spending, it is unlikely that states can raise taxes fast enough to keep up. Higher taxes, then, are at best a partial and temporary solution to a larger long-term problem. Another strategy taken by states is to develop disease management programs in Medicaid. Such programs contain costs for the chronically ill by taking a comprehensive view of a patient or a disease to determine the best course of treatment. The conventional division of roles in the health care services industries can lead care providers to focus on only one disease even though a patient has multiple diseases, or one type of intervention, e.g. surgery, because that is covered by insurance, rather than a prescription drug that might make surgery unnecessary but which is not covered by insurance. Disease management programs can reduce costs as well as improve care. In some cases, doctors can reduce the number of prescriptions a patient is taking, thereby reducing potentially life-endangering drug interactions. In others, managing a chronic condition such as asthma can reduce the incidence of other painful and much more costly health problems. Eli Lilly reports it has agreed to fund an 18-month disease management demonstration project being launched by Colorado's Department of Health Care Policy and Financing. The company's efforts will focus on the management of Medicaid patients with diabetes and Medicaid patients suffering from both schizophrenia and additional medical conditions. The Centers for Medicare and Medicaid Services is beginning a four-year study, called the Medicare Coordinated Care Demonstration project, to test whether combined disease and case management programs can improve clinical outcomes, satisfaction, quality of life, and cost outcomes for beneficiaries with multiple chronic conditions. More than 20 states are now engaged in developing and implementing Medicaid disease management programs, according to AcademyHealth, a Washington DC-based research group. In states that have adopted such programs, early indicators show quality of care has improved through better collaboration among a patient's many physicians and care providers. But only minimal cost savings have been realized. As a defined-benefit program, Medicaid pays for a wide range of defined services regardless of the cost, giving patients an incentive to use all of the services to which they are entitled … even if they don't especially need them. In Oklahoma, for example, Medicaid pays for at least two outpatient visits to a primary care provider per month for some beneficiaries; other beneficiaries get unlimited visits to primary care providers and specialists. Medicaid provides free transportation for medical care in Oklahoma, for emergencies and non-emergencies alike. In fiscal year 2001, nearly 39,000 Medicaid clients made some 260,000 trips, at a cost of more than $22 per trip. "Taxpayers are footing the bill for better coverage than they are willing or able to buy for themselves," said John R. La Plante, a contributor to the journal Perspective, published by the Oklahoma Council of Public Affairs. Medicaid's funding formula exacerbates the problem. Each state receives a different federal matching rate based on the per-capita income of its residents. Because the federal match is as high as 77 percent in some states, politicians decide it is a good idea to expand their programs to optional populations to qualify for more federal funding. But even with the federal match, states have to pay a sizable share of the cost, between 23 and 50 percent of total Medicaid expenditures. The cost of expanding Medicaid can add up quickly … and once in place such expansions are politically difficult to repeal. Rather than raise taxes or cut benefits, states could follow the lead of private-sector employers by moving their Medicaid programs in the direction of defined contributions. Each beneficiary would get a voucher worth a specific dollar amount, and then could use that voucher to choose, from a range of state-approved health plans, the coverage that best fits their individual needs. As a model, states should look to the Federal Employees Health Benefits Program, which currently provides nine million federal employees with a choice of 188 private health plans. Vermont took a step in this direction last year. The legislature authorized a demonstration project that would allow some beneficiaries to purchase private health insurance policies with the funds they otherwise would be eligible for through the traditional Medicaid program. The state would cover all or some portion of the insurance premiums, based on a beneficiary's income, and beneficiaries would also receive vouchers for out-of-pocket costs. The Vermont plan will go forward if funding is appropriated this year. Seven other states have taken advantage of a new waiver initiative introduced by the Bush administration to expand coverage to the uninsured through private health coverage options. 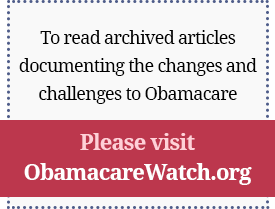 (See "States Use HIFA Waivers to Expand Private Insurance," page 8.) Called the Health Insurance Flexibility and Accountability initiative, the measure gives states the flexibility to use existing Medicaid resources to cover low-income uninsured populations. The HIFA waiver initiative could mark the beginning of a movement toward a defined contribution structure for Medicaid that may well allow states to control Medicaid costs. A third market-based reform is to establish or expand existing high-risk pools for the difficult-to-insure. Such pools currently operate in 30 states and provide private insurance to more than 100,000 people. The Trade Adjustment Act of August 2002 provided states with $100,000 in federal aid for high-risk pools. Market-based reforms, by addressing flaws in the current funding and benefits structure of Medicaid, give states a way to balance their state budgets while ensuring those most in need of government-funded health care will receive it.